One recurring problem with old cameras is tatty leather work. In most cases this can be cleaned up, revitalized, polished and looks fine for years afterwards. 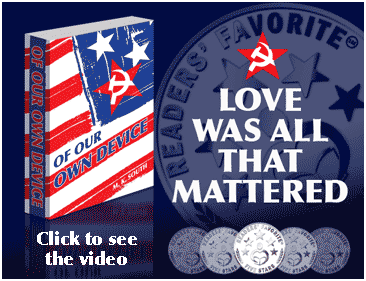 Occasionally the leather has either deteriorated to the point of no return or is just simply missing. An added complication is that most cameras have logos or some other stamping in the leather work. The manufacturers would have made elaborate dies to emboss the leather covering and whilst this is still possible - the cost of this sort of tooling for a one off is prohibitive. This project looks at the technique we have developed to replicate these embossing stamps cost effectively. This Kodak Retina II of 1946 was rescued as a total wreck, after all the mechanics were sorted out there remained the problem of the completely missing leather work from the back, with no starting point for reference a second camera is needed as a pattern. The joy of the internet is the ability to contact like minded individuals. I am indebted to Mr Chris Eve, who also authored a vintage camera website, for photographing his intact Retina II and sending the image. A good clear square image like this is absolutely perfect. Sadly Chris's website is no longer online. The photograph is converted to paths in Photoshop and output, alternatively it can be simply traced. This forms the paper template to be used later. Next a small wooden (or card) frame is constructed about 10mm deep and just a little bit bigger than the logo to be recreated. This part of the process only deals with the awkward logo . Mix up a tub of plaster of Paris just enough to fill the frame and pour it in. After it sets and you remove the frame you will have a block of material that looks like this. Sand one face perfectly flat, the plaster is a soft material that sands easily and will hold quite fine detail. Now it gets awkward, using a very sharp point, carve out the logo. Start lightly at first to keep the curves smooth, This isn't that difficult but may need some practice. Try to keep the depth reasonably constant but this isn't that critical. The carving should taper in naturally with the point of the carving tool, go to a depth that give you the correct width close to the surface. This will be used to make a cast later. 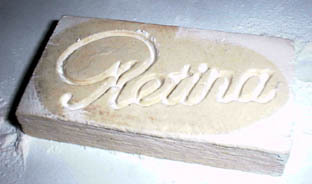 At this stage you can "proof" your carving with plastercine. 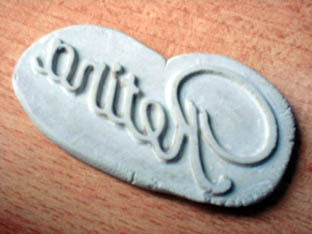 Persevere until you are happy with the plastercine proof casts...you will only get one chance with the final hard cast. Finally press a hard setting body or plumbing filler into the mould and allow to harden. Gently prise out the hardened filler, this often wrecks the mould. Soaking the mould for 24 hours prior to release helps. 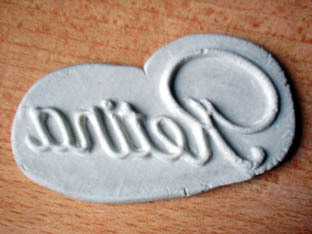 Any plaster remaining on the cast can be brushed out with a stiff toothbrush and delicate attention with a point, the result is a reversed logo as seen here. The final part of the cast preparation is to gently sand it down flat until the characters widen out to the correct thickness. Now it's ready to press into the leather. We obtain our leather from Hewitts of Edinburgh, who are specialist bookbinders. A hide for bookbinding is a called a skiver and come in various qualities, fortunately you can get away with low quality for cameras! However it is hard to find a good pattern match with all cameras. For this camera we used a Morocco pattern, which is a little coarser than the original. To get the leather to hold an impression, you dab water into the reverse until it just starts to release moisture if you press your finger into it , turn it over so that it is face up and place the prepared cast on it in place. Compress the two in a flower press, or improvise with a couple of G clamps and a couple of short wooden boards. 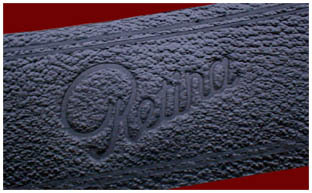 Leave in place for some time, allowing the leather to dry out whilst in compression results in a very crisp impression. 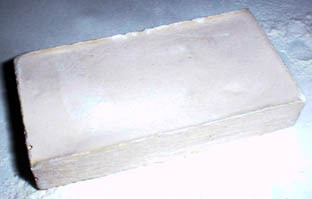 The straight rules are put in after the leather has dried out, using straight edges in a similar way, or can be ironed in with a hot tipped tool. The resulting panel is then trimmed to size and applied to the camera. We use PVA wood glue as it can be reversed in the future should the need arise. 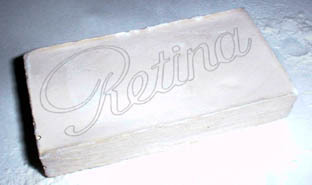 The rejuvenated Retina II, with time the leather will relax and flatten down a little. Vigorous buffing will accelerate the process so that the new panel is a little less obvious. We have changed our method, and now use 3D printing, please see Project 7 for the new version.